More than 250 bicyclists joined the fun at the 23rd Annual Pumpkin Pedal on Oct. 5 in St. Charles! 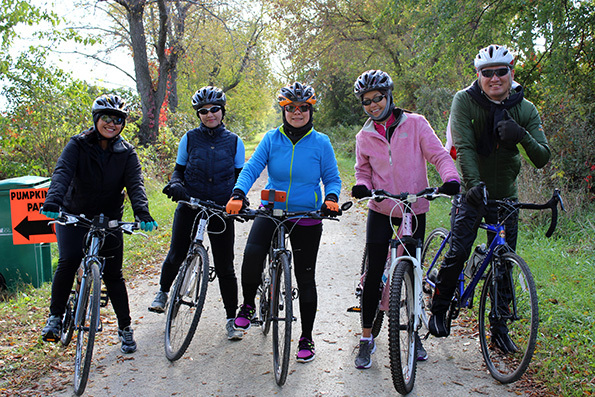 While a little chilly, it was a beautiful day for participants including first-time riders, families and serious riders.This year’s 10-, 20- & 28-mile trail rides were on the Great Western Trail. The 40- & 65-mile road rides were on roads around Leroy Oakes Forest Preserve in St. Charles. 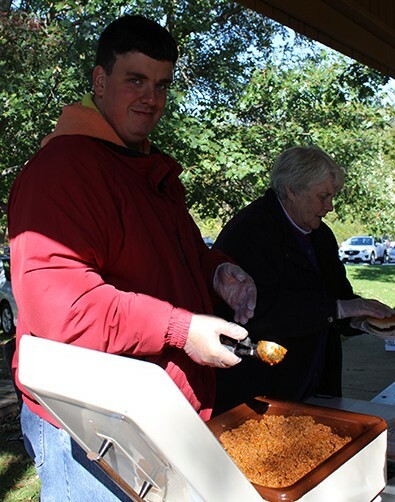 The Pumpkin Pedal raised more than $10,000 for the Areas involved. A post-ride meal of sloppy joes, chips, cookies and a drink was served by athlete Dan James and his parents Judy and Don James.The Jameses have been serving meals for Pumkpin Pedal participants for about 20 years. 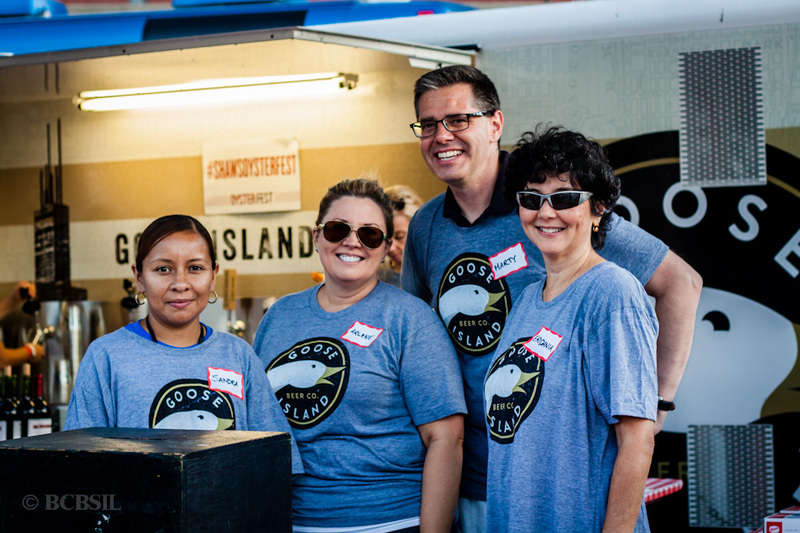 The 26th Annual OysterFest Block Party provided hundreds of guests the chance to enjoy the freshest oysters on the half shell and boatloads of delicious food provided by Shaw’s Crab House, beverages from Goose Island and live music. The outdoor festival was held in the heart of downtown Chicago along the Chicago River on Sept. 26. 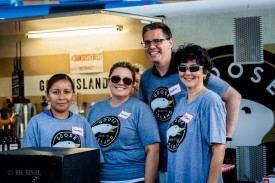 Shaw’s Crab House reached out to Special Olympics Illinois looking to partner by working with our volunteers. Fifty volunteers responded to the opportunity to help at the festival and all had a great time. Shaw’s Crab House, with locations in Chicago and Schaumburg, is among the restaurants operated by Lettuce Entertain You. Event organizers provided all tips shared at the festival and also gift cards valued at more than $2,400 to Special Olympics Illinois. Let the fun begin! 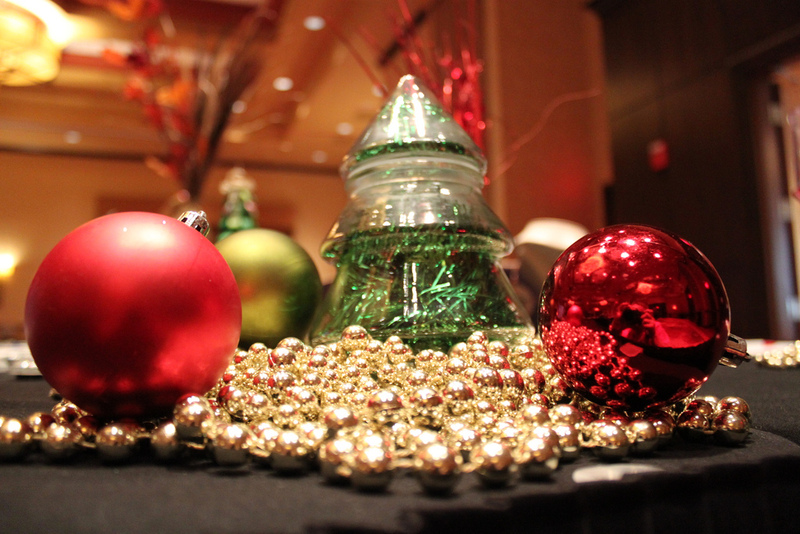 This year’s annual Special Olympics Illinois Holiday Dinner and Auction will be from 6-9 p.m., Nov. 15, at the Marriott Hotel in Normal. Don’t miss your opportunity to be part of this exciting evening. Tickets are now available for $65 per person. Ticket price includes a delicious meal of parmesan crusted chicken topped with arugula, capers and tomatoes, served with garlic mashed potatoes and chef’s selection of season vegetables; or a vegetarian entrée is available. A cash bar is available and live entertainment from the University High School Jazz Band will provide a festive ambiance. During the evening you can begin your holiday shopping in grand fashion by bidding on many beautiful gifts available in the silent auction. After dinner, you’ll have plenty of energy to really get into the giving spirit by taking part in the bidding on the live auction items. All proceeds from the Holiday Dinner and Auction directly benefit Special Olympics Illinois Heartland/ Area 6. Tickets are available online or by contacting Jill Bertelsen at 309-888-2012. All donations are tax deductible and all proceeds go to SOILL Heartland/ Area 6, a 501(c)(3) charitable organization. 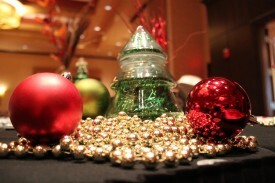 The Holiday Dinner is sponsored by Radio Bloomington (WJBC, WBNQ and B104), First Midwest Bank, Afni and Nicor Gas.